Xbox One fans, we are getting a couple more awesome wireless controllers, and soon! Xbox announced via their news-wire that two new, gradient colored controllers are on their way, and they look fantastic. 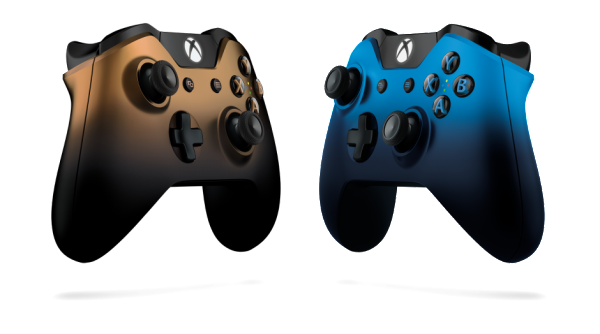 The Dusk Shadow and Copper Shadow controllers feature a faded color gradient finish- blue to black for Dusk Shadow, and copper to black for Copper Shadow, marking a first for this type of color scheme for Xbox One wireless controllers. Of course, they have the standard features we all know and love: impulse triggers, responsive thumbsticks, enchanced D-pad and a 3.5mm stereo headset jack. For me, I think the copper one is a must. It might take over as my favorite controller, dethroning my Titanfall wireless controller, which has been my go to controller since picking it up. Next Win a Trip the San Diego Comic Con!